Pop, Danny Green going 0-for-5 through three quarters, [then scoring] 11 in the fourth, could you talk about what you think got him going late? Midway through the fourth quarter, Pop was ready to do just that. He sent Patty Mills to the scorer’s table to check in for Green, who at the time was 0-5 from the field. For three and a half quarters, Miami essentially made Green disappear, smothering him as though he were in a sauna, which, come to think of it, he kind of was. And then, with his team down four points and with just over six minutes left before they fell into an 0-1 hole, the man Spurs fans on Twitter affectionately call “IcyHot” caught fire. Manu Ginobili took two screens moving right to left across the floor, the first from Boris Diaw and the second from Tim Duncan. As Duncan rolled through the paint, Diaw popped out to the opposite wing. 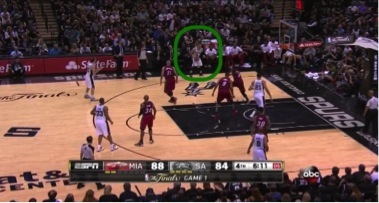 Two defenders chased Ginobili to his left, and Ray Allen sagged just far enough off Diaw to open up a cross-court pass. 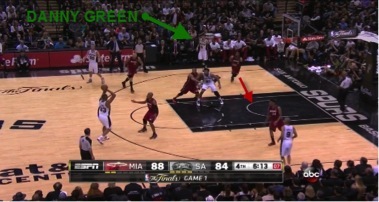 And then Dwyane Wade did what you can never do: He darted into the paint and left Danny Green wide open. The result? Splash, of course. The very next time down the floor, Green found himself open yet again. Diaw drove the baseline and Miami’s swarming defense collapsed around him at the edge of the paint, so he swung it to Green on that left wing. Somehow, the Spurs’ best shooter wound up wide the hell open on consecutive possessions. He cashed in on both looks, and Popovich called Mills back to the bench. Green would eventually add a thunderous fast-break dunk and another catch-and-shoot 3 (on a spectacularly well-designed play that Popovich has actually used twice before to get Green a game-winning jumper) for good measure. All told, Green went 4-for-4 from the field, 3-for-3 from 3, and dropped 11 points while playing 4:41 of the final 6:30 as the Spurs outscored the Heat, 26-7, to seal their eighth consecutive home playoff victory by 15-plus points. Again, this was after he shot 0-for-5 in 23:27 of court time through the first three and a half quarters. IcyHot, indeed.